Living Waters Ministries is an interdenominational Christian Charity with a “7 Fold Vision” of making disciples and helping the poor. A total of 480 students go to our Primary and Secondary School where they receive an education in the Tanzanian curriculum. 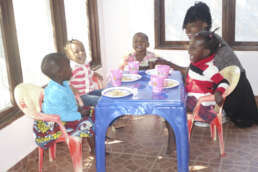 Providing an education to the poorest in Tanzania is one of the key elements of our organization. We believe not only in educating the children but in caring for their physical and spiritual health. Taking care of children at risk, caring for the hungry and ultimately providing jobs are our main goals. Training our students in prayer and the ways of god we encourage them in their lives. We try to reach all children troughout the community with regular Evangelism and Baptisms. This is an intro text about our seven fold vision. Living Waters Ministries was founded and is directed by Carolyn Philpott, who has overseen the ministry’s development and co-ordinated day to day events since the ministry’s first days. Among other things, she ran a car rental company in San Francisco, helped develop a tennis club complex in California, before being sent out as a missionary. 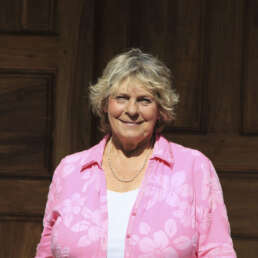 Initially she ran a rehabilitation house in Bromley, Kent, before moving on to developing a Christian conference and retreat centre in North Wales (UK). Carolyn began missions work in Tanzania in 1992, and now spends much time overseeing the projects and operation of Living Waters Ministries. She has sought to serve the Lord’s will and fulfil his plans and purposes. I am Happiness Godfrey and I thank God for giving me life and I am doing well in my studies. I have lived here for 10 years as I was only 7 years old. 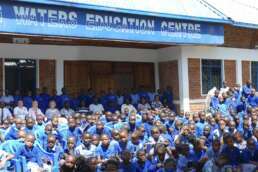 I attended Living Waters Primary School which is such a nice school with many teachers. I am now attending our secondary school. I would like to thank the King Of Glory Ministries for their wonderful support that allows me to live here, receive a good education and care with spiritual guidance. I love Living Waters because Living Waters helps in Religious teaching to fulfill our dreams. I wish to become a doctor or dentist. Living Waters Christian Secondary School has many teachers, good classrooms, laboratory and library. Our studies are good because we have been taught well. We thank Living Waters Ministries for sponsoring us. I am grateful for this school. I love Living Waters Ministries. I have been here for 9 years as a teacher. I have experienced a lot happening in my service. I became the Head teacher, I have gotten married and have had a child. I’m presently attending The Open University of Tanzania for higher education and to continue developing teaching skills through the support of Living Waters Ministries. We are a Christian organisation with a 7 Fold Vision, located in Tanzania.